Ethiopians rally in solidarity with Prime Minister Abiy Ahmed in Meskel Square in the capital, Addis Ababa, Ethiopia Saturday, June 23, 2018. A deadly explosion struck the huge rally for Ethiopia's reformist new prime minister on Saturday shortly after he spoke and was waving to the crowd that had turned out in numbers unseen in recent years in the East African nation. 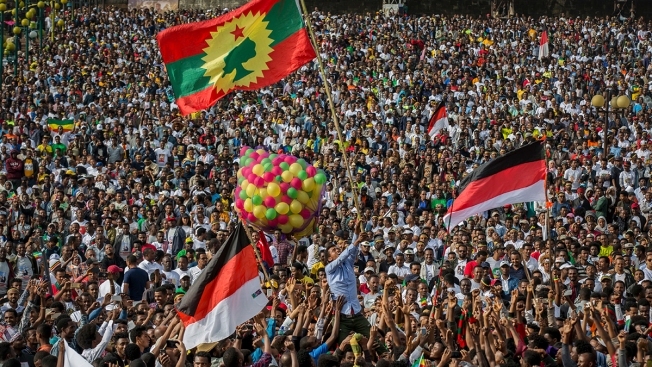 A thwarted attempt to hurl a grenade at Ethiopia's reformist new prime minister led to a deadly explosion Saturday at a massive rally in support of sweeping changes in Africa's second most populous country. Nine police officials were arrested, state media reported.